New SmartPro Solution will enable ag professionals to enhance their digital connection with customers, positioning their businesses to thrive. WINNIPEG, Manitoba – September 25, 2018 — Farmers Edge™, a global leader in decision agriculture, announced the launch of a new solution designed exclusively for agricultural professionals to enhance their relationships with customers and spike their business growth through the use of precision digital tools. 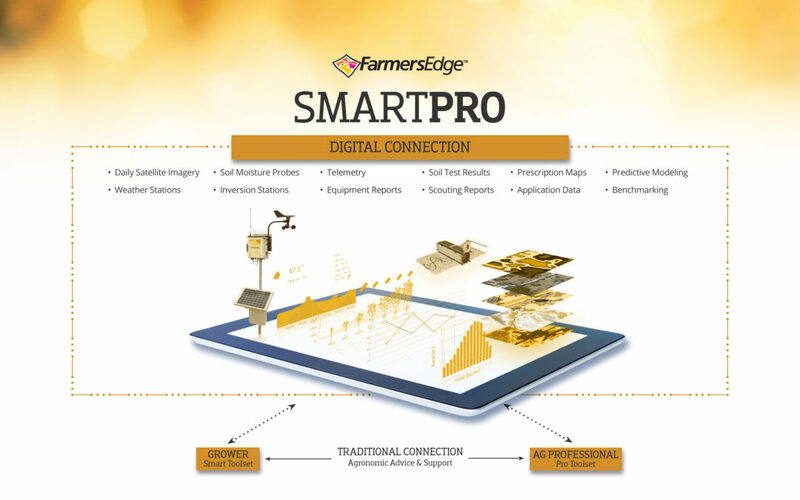 SmartPro pairs Farmers Edge industry-leading precision digital technology with the trusted agronomic expertise agricultural retailers, representatives, crop advisors, and agronomists are known for. With unique offerings powered by field-centric data collection, advanced analytics, integration and real-time data, ag professionals will have access to insights that provide a deeper understanding of growers’ needs, allowing them to deliver a higher level of service. Ag professionals are limited by time and resources; SmartPro is a scalable solution for providing sampling, scouting, and Variable Rate programs across more fields, in less time. SmartPro is available in all the regions Farmers Edge currently operates in: Canada, USA, Australia, Brazil, Russia. Visit farmersedge.ca/smartpro for more details.